Today a visitor can enter the Old City of Jerusalem by one of seven gates. Some gates were named by location. The Jaffa Gate faces west towards Tel Aviv and Joppa. The Damascus Gate is in the North wall where a traveller would enter if he had come from Galilee, the Golan Heights and Damascus. The Zion Gate is, logically, on Mt. Zion near the traditional Tomb of David and site of the Upper Room of the Last Supper. The Dung Gate faces south towards the Hinnom Valley where refuse from the city was dumped in former times into the valley. The Sheep Gate (or St. Stephen's Gate, or Lion's Gate) is next to the sheep market and so on. The present walls around the Old City were built from 1537 to 1541 by Sultan Suleiman the Magnificent after the Ottoman conquest of Israel. At that time most of the ancient walls were reduced to rubble. Suleiman ordered that Jerusalem be fortified to protect its people against marauding Bedouins. The walls were rebuilt upon the foundations of the walls constructed during the time of the Second Temple and the later Roman expansion. In the Jewish Quarter in the Old City one can see an uncovered section of the wall built by Nehemiah at the time of the return from the Babylonian exile. The Old City retains its charm and fascination to this day. Narrow crowded shops and the Oriental bazaar with its many markets offer endless adventure for visitors and pilgrims. It is hard to escape the feeling that one has stepped in the timeless, changeless past. Each quarter of the Old City brings an immediate shift in architecture and shops, in passers-by and inhabitants alike. The Temple Mount is conspicuous whether viewed from the Mount of Olives, or from the Lutheran church tower across from the Holy Sepulchre, or from the Citadel Museum roof. Normally tranquil and peaceful with its park like setting; one would hardly guess that this small parcel of land - less than 50 acres - is the centre of the world and the hottest piece of real estate anywhere on earth. Biblically speaking, it's most exciting history lies yet ahead. The Golden Gate was walled up by the Arabs in the year 810. It has remained closed now for nearly 12 centuries. It is a now-closed double gate. The North portal is known as the Gate of Repentance, and the Southern Portal, the Gate of Mercy. Facing the Mount of Olives on the eastern side of the Old City of Jerusalem is the Golden, or Eastern Gate. The Ancient Eastern Gate to Jerusalem could be the one mentioned as the "Beautiful Gate" in Acts 3: 2, 10. The term Golden Gate may have been derived from the Latin Vulgate version of the Bible: In the earliest Greek New Testament, the word for 'beautiful' is oraia. When Jerome translated the New Testament into Latin in the 4th Century he changed the Greek oraia into the similar sounding Latin aurea, rather than to the Latin word for 'beautiful.' So the Latin Vulgate text read 'Golden Gate' instead of 'Beautiful Gate.'" (BAR, Jan / Feb 1983, p.27). The Golden Gate has long interested most Jews and Christians and many Muslims as the place of the Last Judgment. Historically, judgments were rendered in the gates of the city i.e. Gen. 19:1, 23:10. Since the Messiah was to come from the East (Matthew 24:27), it was concluded that his judgment would be at the eastern gate. This is one reason for the many Muslim, Christian, and Jewish graves on the Eastern slopes of the Temple Mount, in the Kidron Valley, and on the Western slopes of the Mount of Olives. 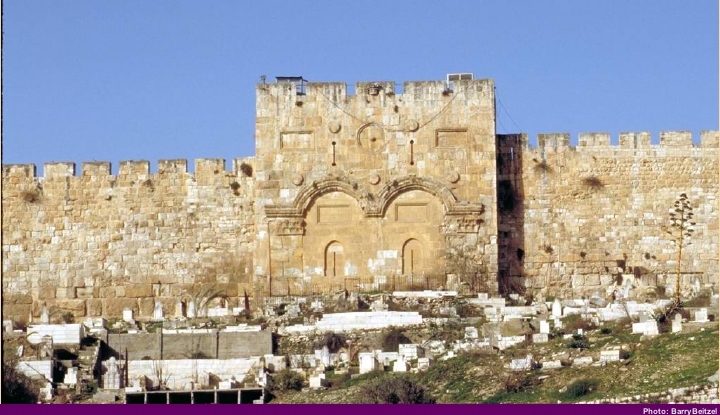 Jews link the Messiah's arrival with this gate and Christians have for centuries associated the Golden Gate with Palm Sunday and also with the Second Advent (Luke 19: 35 – 38). Jews expect the Messiah to come through the Golden Gate, Muslims also expect Jesus to return to our world at the end of the age to participate in the final judgment. Christians believe it will be Jesus Christ who will conduct that final judgment. Zechariah 14:4-5 clearly states that the Messiah of Israel will return to Jerusalem from the summit of the Mount of Olives and then surely proceed into Jerusalem from the east in the direction of the Golden Gate. Because of the Messianic association with the Golden Gate - which clearly symbolizes both judgment and mercy and because of the Arabic names attached to the gate - all three faiths have wanted to be buried as close as possible to the Golden Gate. The assumption was that the dead in the immediate vicinity would be the first to be raised. In the Middle Ages the Jews were forbidden to bury on Mount Moriah. Instead they buried their dead opposite the gate and to the South on the Mount of Olives. This Jewish cemetery is the oldest in continuous use anywhere in the world. A burial plot, it is said, if it were available there, could cost $50,000 or more. The Christian cemetery lies in the bottom of the Kidron Valley (in sad condition) while the Muslim burial area covers the eastern Temple Mount hillside up to and surrounding the Golden Gate. The Bible indicates that Yeshua passed through this gate many times while he was in Jerusalem. Since Jewish religious tradition teaches that the coming Messiah will enter Jerusalem through this gate. To prevent this, the Muslims sealed the gate during the rule of Suleiman. Nearly 2,000 years ago, Yeshua stood on this hillside overlooking the Old City making prophesies that would change the world. According to Jewish tradition, the Messiah will come through the Golden Gate (or Gate of Mercy) of the Old City and bring about the resurrection of the dead in the cemetery on the Mount. Unlike the lush expanses of grass associated with many cemeteries, the Mount of Olives is a mountainside of stones. Ironically, Yeshua (Jesus) ascended up into Heaven from the Mount of Olives, which overlooks the Eastern Gate to the west. Ironically from that stony mountain top, Yeshua ascended as the chief cornerstone for the up-building of Mount Zion. It is to the Mount of Olives that Yeshua will return in the last days. Ezekiel 44:1-3 "Then he brought me back the way of the gate of the outward sanctuary which looketh toward the east; and it was shut. Then said the Lord unto me; this gate shall be shut, it shall not be opened, and no man shall enter in by it; because the Lord, the God of Israel, hath entered in by it, therefore it shall be shut. It is for the Prince; the Prince!" The Eastern gate remains shut and is awaiting the coming Prince of Peace! The pillars of the Golden Gate are said to be a gift of the Queen of Sheba to Solomon according to one ancient legend, but these would not be part of the present gate above the surface of the ground which is too recent. Some scholars have noted that the double gates of judgment and mercy contrast not only "Law and Grace" but are reminders of the two bronze pillars, Jachin, "in his counsel" and Boaz, "by his strength" which stood in the front of the First Temple. The interior corridors of the Golden Gate are exceptionally beautiful and well-built according to published reports. Sadly, visitors to the Temple Mount today are not allowed to inspect the interior of the Golden Gate. Nor can tourists walk through the Muslim cemetery along the Eastern Wall to inspect the exterior of the gate. One can only hope that this gate can be reopened in the near future and fully restored for access to the Temple site by all nations. Ironically the gates of Heaven are never shut. The shutting of the Eastern Gate of Jerusalem is symbolic of the fact that Israel shut the gate to God by the folly of their pursuit of other gods and unbelief. Therefore they knew not the Messiah upon the occasion of his visitation unto them 2000 years ago. Thus their rejection of the Messiah stands as a historic monument symbolized in concrete by the shut gate to Old Jerusalem. Yeshua prophesied to Israel about the desolation of their Temple, and that desolation continues to this very day. The shut gate also symbolizes the reality of the supernatural battle that is even now waging over the Temple Mount. But the Lord shall return and open the gate, and rebuild the Temple, and Israel shall know the Lord. Very soon after this discovery the Muslims covered the chamber, cemented over the top, and surrounded the mass grave with a protective iron fence. Sadly, this means it is unlikely that Israeli archaeologists will be able to excavate the gate under the Golden Gate in the near future. In contrast visitors to the Damascus Gate are now able to visit an ancient, restored old Roman gate beneath the present Damascus Gate (the present upper Damascus Gate was reconstructed in 1537 – 38). Rubble and earth, and the Muslim cemetery, extend high up on the Eastern Wall of the Temple Mount. Thus very little is known about the lower portions of this wall below the present ground level. "Afterward he [the Angel of the LORD] brought me [Ezekiel] to the gate, the gate [of the temple] facing east. And behold, the glory of the God of Israel [the Shekinah] came from the east; and the sound of his coming was like the sound of many waters; and the earth shone with his glory. And the vision I saw was like the vision which I had seen when he came to destroy the city, and like the vision which I had seen by the river Chebar; and I fell upon my face. As the glory of the LORD entered the temple by the gate facing east, the Spirit lifted me up, and brought me into the inner court; and behold, the glory of the LORD filled the temple. While the man was standing beside me, I heard one speaking to me out of the temple; and he said to me, "Son of man, this is the place of my throne and the place of the soles of my feet, where I will dwell in the midst of the people of Israel for ever. And the house of Israel shall no more defile my holy name, neither they, nor their kings, by their harlotry, and by the dead bodies of their kings, by setting their threshold by my threshold and their doorposts beside my doorposts, with only a wall between me and them. They have defiled my holy name by their abominations which they have committed, so I have consumed them in my anger. Now let them put away their idolatry and the dead bodies of their kings far from me, and I will dwell in their midst for ever." Most Jews believe that the Messiah they are looking for will be the same kind that the Jews of Yeshua’ s day were seeking – a great leader who will defeat all of Israel’s enemies and in the glory of the Lord bring all the blessings promised in the covenants. Evangelical Christians may be confused or frustrated why some Jews do not love them as much as they love the Jews, or why Jews will not accept Yeshua as their Messiah, Lord and Saviour. However, the Jews have been persecuted and killed by the same State Church in Spain and even Protestants in Germany, Poland, Eastern Europe, and the Russian Orthodox Church in the Soviet Union. On the historical basis, the Jews have more reason to fear Christians than to love them. Nevertheless, today Evangelical Christians are the best friends in the world that Israel has! Whoever wants to know the heart of God will do so by acquainting himself with His people Israel. Let Him consider God’s leading for His people. From an earthly fathers dealings with his son we are given a glimpse of his deepest relationship to his child, so too from God’s dealings with Israel, His first born son. We can learn from God’s leadings for Israel, His attitude towards the sons of men in general and what purposes are in His heart when He leads us one way or the other, along paths of judgement or paths of grace. For we read of both in the History of Israel. Indeed, Israel, as the beloved child of God, is set before us as a mirror reflecting the heart of God, showing us who God is. We see that He is the Father of love, for only a loving heart can pour abundant grace over a people and prepare glory for them, such as we see prepared for the people of Israel. However dearly an earthly father may love his child, he could never grieve over him the way that God grieves over His people Israel, as expressed in the words of Scripture. This is not to be taken merely as a proof that Israel has sinned a great deal and was a wicked people. Admittedly, Israel did sin a great deal and encaged in many evil practices. But the fact that God grieves and laments so deeply is primarily indicative of His loving heart. Isn’t it amazing that we have learnt that God is speaking to us even through the shut (Golden) Eastern Gate that though JUDGMENT there is also MERCY for Israel? When you have been through many close experiences with a person such as the relationship between husband and wife, your soul is knitted to that person through both good and hard times. 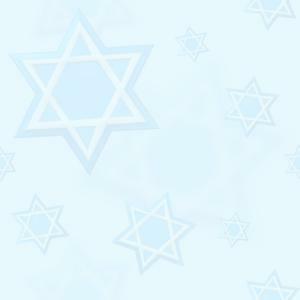 In like manner God’s Covenant with Israel is time-honoured and knitted. Yeshua said in John 4:22 "Salvation is of the Jews," because it was the Jews who preserved both the Scriptures and the Messianic bloodline. In other words, in times past, God and Israel has been through so many good and bad times together that He, the wounded but faithful lover is craving and longing for their reconciliation. What did the Apostle Paul actually mean that by the mercy of Gentile believers in Yeshua that the Jews would obtain the mercy of God? Can’t the Jewish people return to God without the aid of Gentile mercy? God Almighty is surely able to graft them in again, for He has the power to do it. However, because of His predetermined law of mercy, the Gentiles are part of His council and program to win back the Jews! The New Testament teaches in Romans 11: 30 – 32 that God turned to the Gentiles and bestowed His mercy upon them because of the Jews disobedience and unfaithfulness to Him. They have been disobedient so that by the mercy shown to Gentile believers, the Jews also may obtain mercy. So God will have mercy on Israel through gentile believers acting as mediators towards them. This is one of the most amazing revelations ever given to the church – an opportunity to do something that carries the highest priority in the heart of God. Yet so few have seen the potential and the rewards of serving God in this manner, as agents of mercy to Israel! Many are involved in the noblest task on earth; soul-winning. But even that, according to God’s word, has a priority: "to the Jew first..." according to Romans 1:16. If you preach to the gentiles but have never been concerned to share the Gospel with the Jewish people, Scripture says you have put the cart before the horse! We need both the cart and the horse! Just as Israel has been blind to the person and purpose of Yeshua HaMashiach (Jesus Christ), so the church has been equally blind to the ministry of mercy o Israel. Just as the Jews at large (not all!) have missed it concerning Yeshua, so the church, generally speaking, has missed it concerning the fulfilment of prophecies in the modern State of Israel. It’s useless to point a finger at the Jewish people and say, "You missed it!" when the church at large is also "missing it!" failing to see God’s timing and restoration of the Jewish people. The hour is late on God’s agenda. Perhaps He has already taken away Israel’s heart of stone and replaced it with a heart of flesh, according to the prophecy in Ezekiel 11:19. Many Bible believers feel this has already happened. In 1967, Israel regained Jerusalem and, therefore, the times of the Gentiles were technically fulfilled, according to Luke 21: 24. At that time many Jewish people began to believe in Yeshua and Messianic movements proliferated. This does not mean that Israel has returned to God. But because their heart of stone is being replaced by a heart of flesh – or currently is in a transformation process – this means that Israel is capable again of responding to God’s love. Like Pharaoh‘s heart, Israel’s heart was judicially hardened by God for a set period of time. But if God is removing their heart of stone, as prophesied, who are we to oppose God’s purposes? Rather let’s flow with them! Those who are wise will see the tenderised heart condition of Israel now and will begin to woo her back to God.